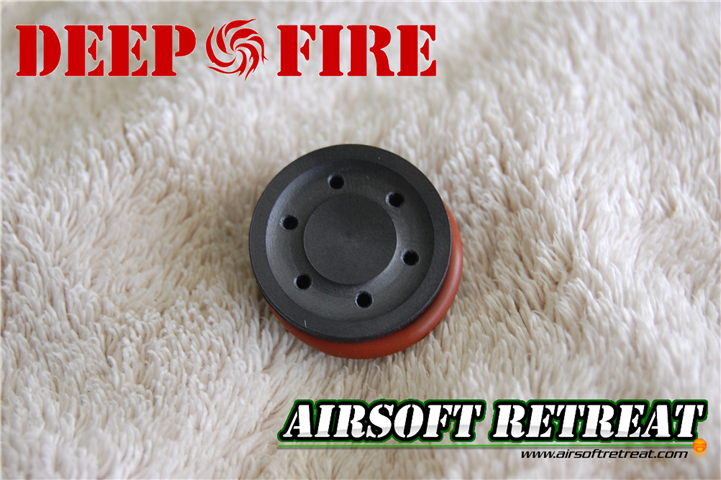 Deep Fire continues to produce innovative new products for airsoft replicas, and their new piston head is on the cutting edge as far as materials and craftsmanship goes. 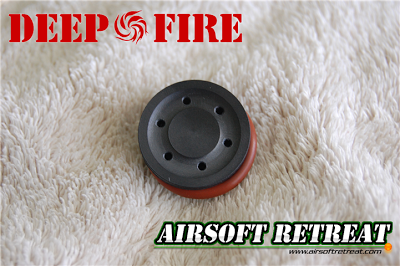 Their new upgrade piston head is manufactured out of a new material for the airsoft market, graphite fiber, which combines high strength, great wear resistance, and light weight, making it pretty much a perfect material for piston heads. I will discuss this new piston head in this mini review, so keep reading for more information! I was sent this piston head directly by Deep Fire, in order to give it a first look here at Airsoft Retreat. It is available in very limited quantities from various retailers, including Redwolf and eHobby Asia, where it is priced at $39.00. The price includes Deep Fire's “Super O-ring”, as well as a ball bearing base for smooth operation and reduced spring binding. It's a little bit more expensive than other piston heads, but for reasons I'll detail later on, it should be the last piston head you will need to buy. The design of the piston head is quite standard, with a ported layout to flare out the o-ring while firing and give a perfect airseal. The big difference between this and other piston heads is the material that it is made out of. According to my brief research onto the graphite fiber material, known as PEEK-HPV-PTFE, is has several distinctive properties, including it's low coefficient of friction, very high compressive strength, but with a low weight, to prevent excessive transfer of energy into the gearbox shell. This gives you all of the strength benefits of an aluminum piston head, without the downside of increased risk of damage to the gearbox. Deep Fire secured the piston head in a retail ready package with a plastic front section and a cardstock rear holding everything inside. Included with the piston head is the ball bearing base, red colored o-ring, metal bearing support, and the screw to hold it all together. Throw it on your piston of choice, and you're ready to roll! As I've already bored you with the details of the piston head design and materials, I'll just be showing some more detailed pictures of the unit itself. Overall, the thing is as advertised, light and strong, and the included o-ring and ball bearing base add to the performance potential. However, a product that is all show and no go is useless in airsoft, so let's throw this thing into a gun and see how it does! For my testing, I elected to install the piston head onto my Deep Fire full titanium tooth piston, which is in turn installed into my ever evolving Deep Fire Silver Series M4. Installation was a breeze, and there were no fitment issues onto the Deep Fire piston. The test gun has previously received a set of Deep Fire titanium gears, as well as an M120 FTK, which utilized an aluminum piston head. I was getting about 401 FPS with the stock Deep Fire spring with the FTK installed. After installing the new graphite fiber piston head, I saw a slight bump in FPS, up to 406.7 on average, and an increase of 1-2 RPS over the aluminum head. I'm assuming that the increased performance is due to the lighter weight of the piston head, allowing the entire piston to accelerate and reciprocate faster, giving a boost in FPS and ROF. Time will tell as far as the increased durability over an aluminum piston head, but the gearbox feels and sounds better while firing. It's hard to quantify, but I think the lighter weight and more forgiving material attribute to it. Tweaking all of the various internal parts for optimum performance is one of the best parts of the whole airsoft experience. It gets even better when companies like Deep Fire keep coming out with new, innovative products to maximize your gun's potential. The new graphite fiber piston head certainly falls into that field, and I hope we can see more products made out of this innovate material.